Indian wedding which usually last for 3-4 days and in some traditions a week too depending on the rituals, thus your Reception Ceremony plays a big role like that of a grand finale to all these wedding ceremonies. After you make a stunning appearance in wedding outfit, you have to do the same in your evening look too. Your Reception dress serves as a style moment and also makes you party ready. Wedding Reception Ceremony is all about meeting guests, dancing, cocktail, sweet treat and enjoyment. It is very important that you choose an outfit that is stylish and comfortable at the same time for this wedding Reception Ceremony bliss. In the morning you may prefer Indian ethnic but for evening celebration you should go for classic outfit or try to go for fusion of ethnic and western outfit like Indo Western. Make a style statement with amazing designer outfit that maintain dapper look while you can relax in it. Unlike foreign countries Indian reception Ceremony are taken into consideration as wedding ceremony with many rituals associated with it. Well, you just don’t need a perfect outfit but also coiffured Hairstyle, stylish Accessory, groomed Beard and comfortable Footwear to get your Reception ready look. Here, I will specifically talk on some outfit you should try and opt for while attending your relative’s or friend’s Reception Ceremony and of course on how you should style yourself for own Reception. I know you can’t stop imagining yourself making a grand entry with your life partner on the reception entry song into a fully decorated venue to celebrate your new life. Reception itself is a celebration of your hearts coming together start it with a bang! It may sounds like a fiction and all your dreams for your future but here is the reality you are stepping into a new life with the love of your life. A right outfit is a must, all this time you attended other’s Reception Ceremony parties but here it’s ours, you have to look your best. Try to go for Suits with all its accessories like Lapel Pin, Pocket Square, Necktie, Suspenders, watch and Cufflinks. You can also go for Tuxedos if you don’t want to keep it too formal by wearing a suit. Try to go for black, navy blue or brown colour Suit this will make you look more handsome, as it is you have to complement the bride. You can experiment with Blazer colours as it will look good in all its shade but try to go for burgundy, light blue or off white. Avoid going for Checked Suits as it gives too formal appearance and can make you look like you are attending a business meeting instead of a Reception, choose wisely. Finally your friend is married! To celebrate his new life ahead you show it up by your presence in the Reception ceremony. Well, you should dress up modestly to make sure you look the best after the groom of course. To maintain your look as you did for other ceremonies like Haldi, Mehendi, Sangeet and Wedding Ceremony you should choose the right outfit taking into account your body shape, skin complexion and height. I would suggest you to opt for Solid colour Shirt and pair it up with good Waistcoat that will enhance your look. If carrying this is too much for you and you can’t manage to dance and roam around go for a Bow Tie and Suspender over a Shirt this will add chic to your look. Make sure you Wear perfect shoes for this event that is a good pair of derbies and oxfords. Well, if it’s your cousin’s or a close relative’s Reception you should dress up well as there will be many guests who may notice you. You know how many relatives are they just need a spicy hot topic to discuss and if you enter the Reception celebration being a fashion disaster they will get one. 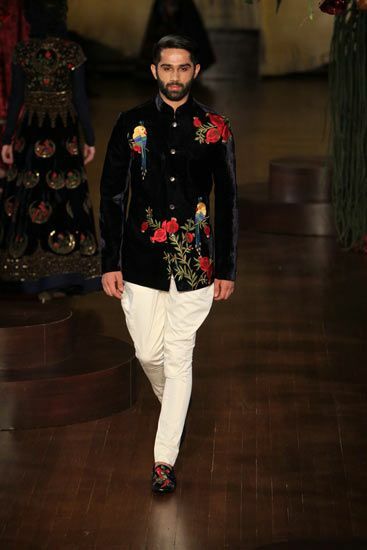 Try to go for a Blazer if very close relative’s wedding and if not so than you can go for Jackets. Try to go for one shade Blazer to maintain the elegant look or you can also go for printed one with good colour contrast and embroidery work. Don’t you go to the Reception wearing Sandals as it is a bit casual and wont suit your look. Here you go, Reception ready! Hope You Got The Relevant Information Related To Reception Ceremony You Were Looking Out For. If Yes, Don’t Forget To Share!